Paros is one of the most popular Greek islands with its beautiful beaches, white Cycladic houses and is considered to be one of the best spots in the Greek isles for windsurfing. It is one of the quieter Islands and has wonderful beaches, traditional villages with amazing fish tavernas on the water's edge and bags of cultural history to explore. 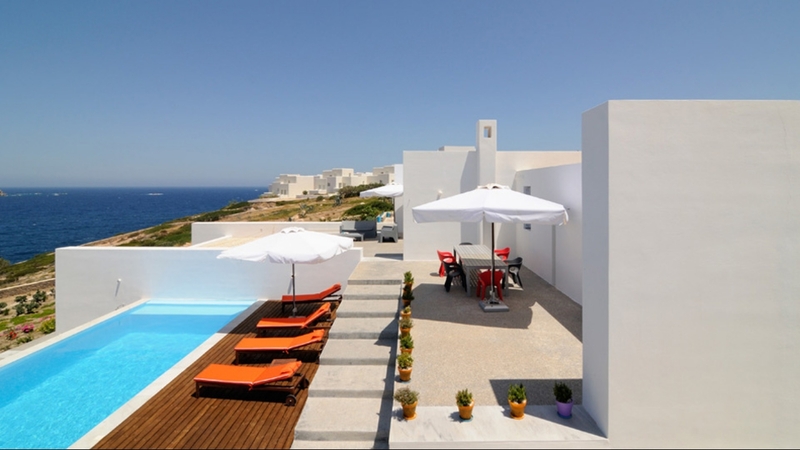 Why not choose one of our luxury villas in Paros, Greece and enjoy a truly memorable holiday. A super-stylish hill-top retreat on the Island of Paros, Villa Aesop is a gorgeous summer home with striking sea views and a breathtaking sunset from every vantage point. 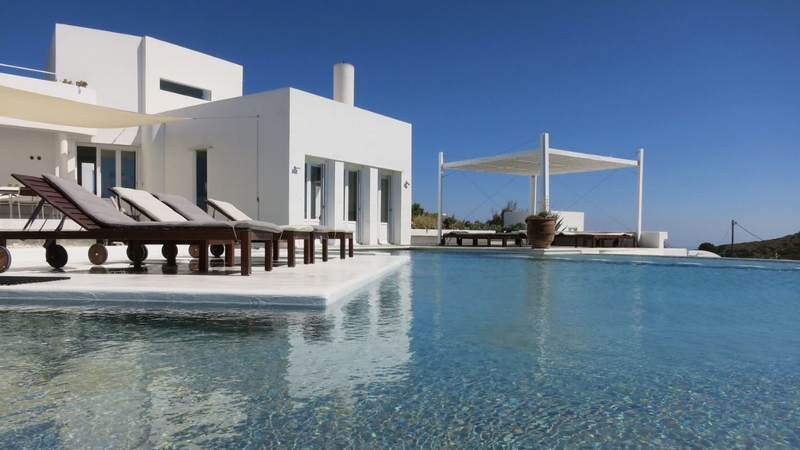 Villa Dura is a stylish contemporary retreat with glorious panoramic coastal vistas. 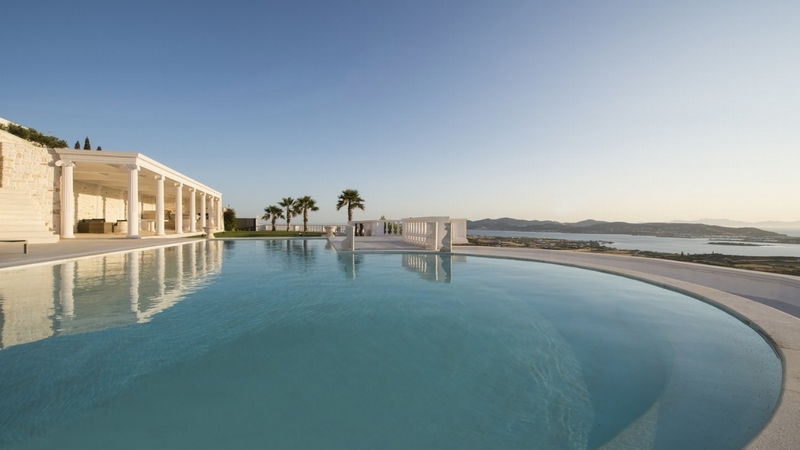 Villa Gratiana is a gleaming Ancient Greek marble marvel with a modern twist, close to Paros town and rewarding guests with show-stopping Aegean views. Villa Jero is a stylish traditional villa situated just above the picturesque village of Lefkes and offers photo-worthy coastal and rural shots from every vantage point. Nestled amidst tropical gardens and lush greenery, this villa offers a luxurious oasis of relaxation. 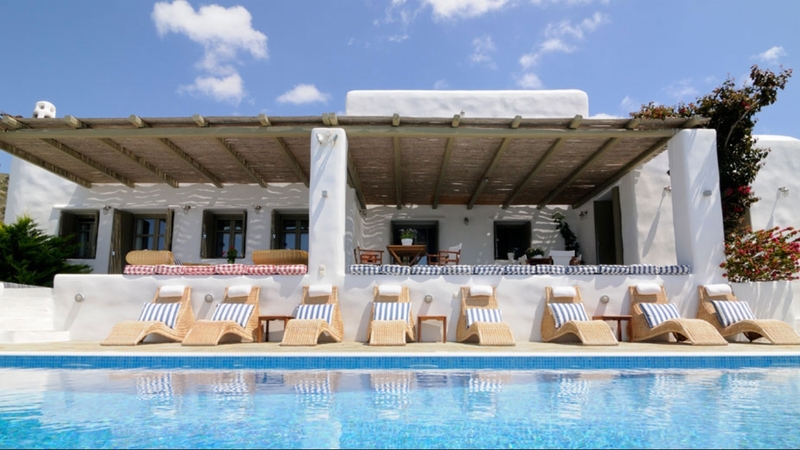 This villa is a beautiful five bedroom summer home situated in the remote area of Makria Miti, at the tranquil southern coast of Paros. A homely island getaway by the beach. 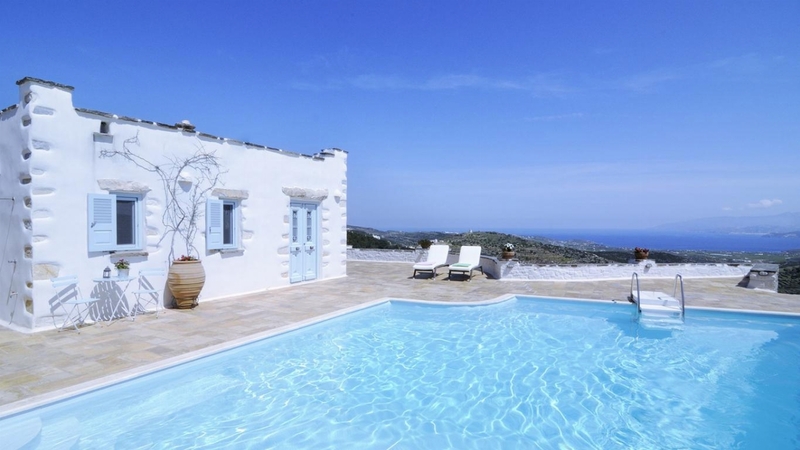 Villa Krotiri is a delightful stone built house with bags of character and charm and sits right next to a sandy beach with crystal clear waters. 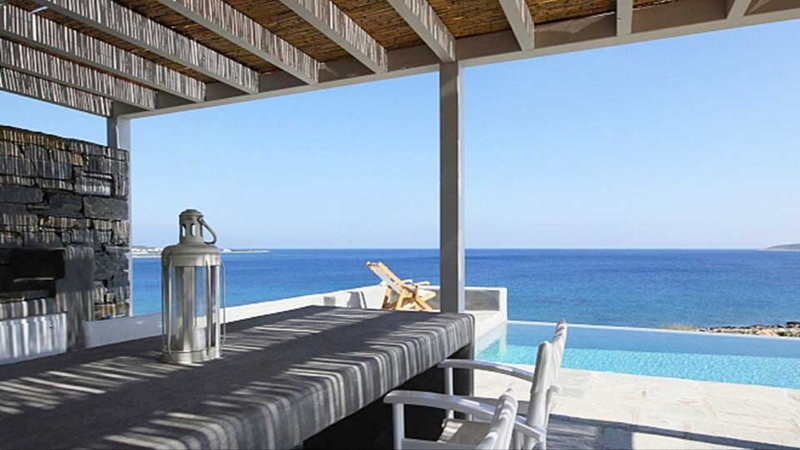 A beautiful private Greek villa perched above acres of olive vineyards, Villa Armonia offers extensive colourful sea views over the islands of Antiparos. 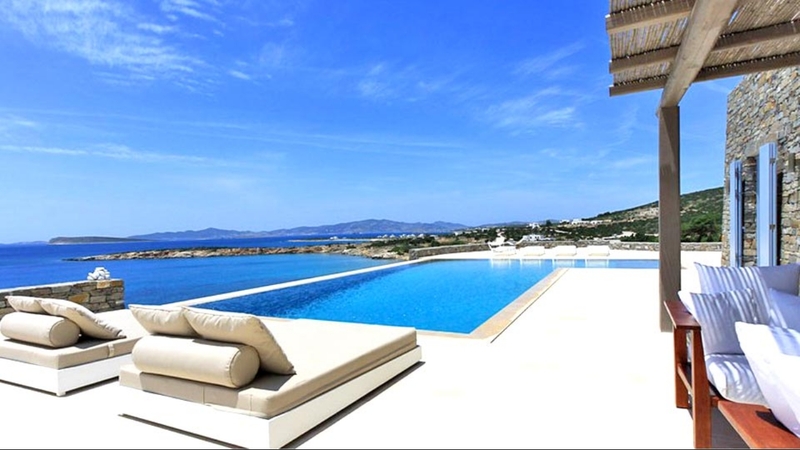 Situated at the South-western part of Paros, overlooking the island of Antiparos and just a hop from a lovely pebble beach, Villa Rhea boasts an elusive combination of a pool and direct access to the sea. Less than 10km from the island's main town and tucked away amidst green hills that overlook the eastern coast of the island, lays an idyllic settlement that has been thankfully untouched by mass tourism. 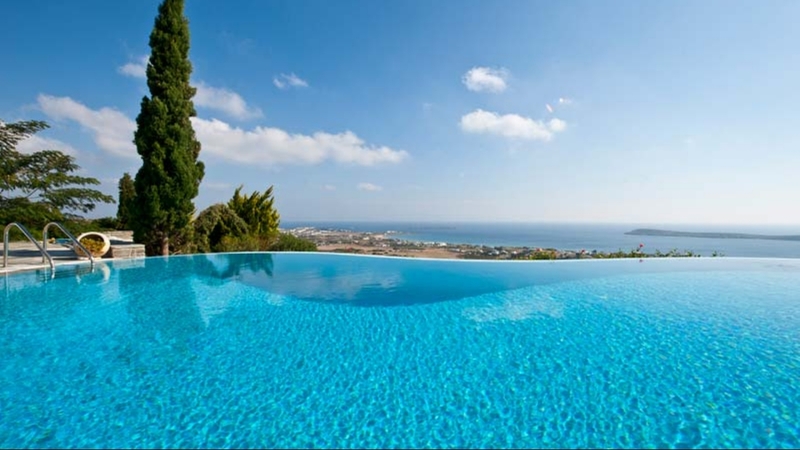 Beautifully peaceful and gorgeously simple, luxury Villa Gambino is situated in an area flooded with light and space, ensuring far reaching views of the ocean and privacy for the guests. 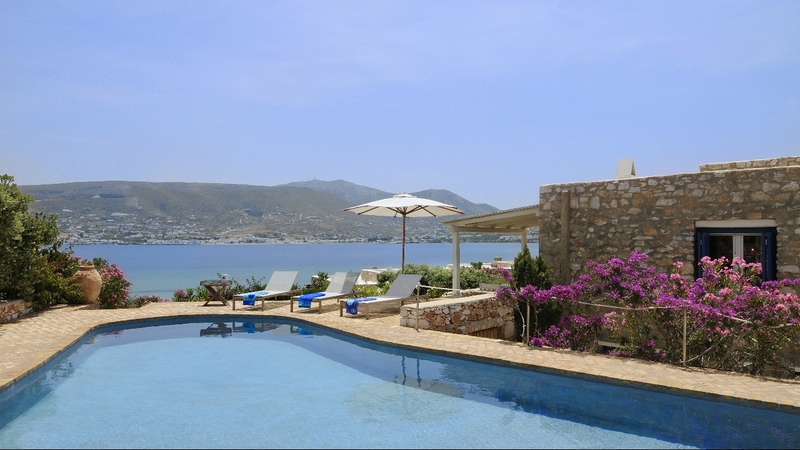 Villa Flora is a handsome island home located in Ambelas, a quaint seaside village just off the town of Naousa. Standing on a hill in the southern area of Paros, overlooking Farangas Bay, Villa Marini is cleverly designed to maximize its wonderful panoramic position. Not far from the bustling centre of Paros, on the west part of the island lays the tranquil bay of Agia Irini, a charming enclave with a lush little beach and an off-the-grid vibe. Villa Levinia is a six bedroom luxurious villa situated just a short walk from Kolybithres sandy beach and the ancient Mycenaean Acropolis. Overlooking the blue of the Aegean, this holiday villa is a charming private property rental, located in a very panoramic position just a few minutes drive from the sea. 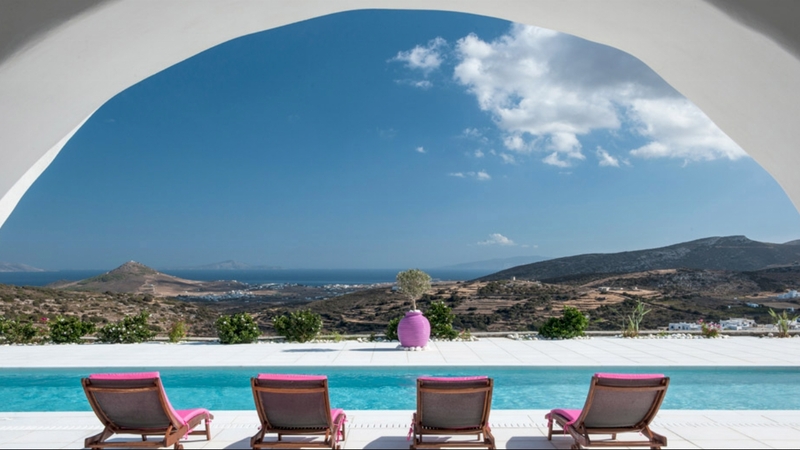 Set in one of the most privileged locations of southern Paros, Villa Andria is a gorgeous six bedroom holiday villa rental with striking views of the bay of Faragas and a breathtaking sunset. Villa Flanders touches the blue waters of the Aegean Sea thanks to the superb location just a few steps away from the sea at Makria Miti. Beautifully located in the quaint fishing village of Ambellas, in a peaceful complex of five villas, just a few minutes from the beach, Villa Azura is a beautiful summer house, offering enchanting sea views, privacy and serenity. Tucked away in a vast estate, located only a few minutes away from a sandy cove with crystal waters, Villa Forula is a beautiful holiday villa that offers perfect seclusion for a summer rental. If you want to escape the crowds that flock the islands during peak season, the southern coast of Paros with its calm waters, charming villages and scarcely inhabited countryside, is an excellent choice. 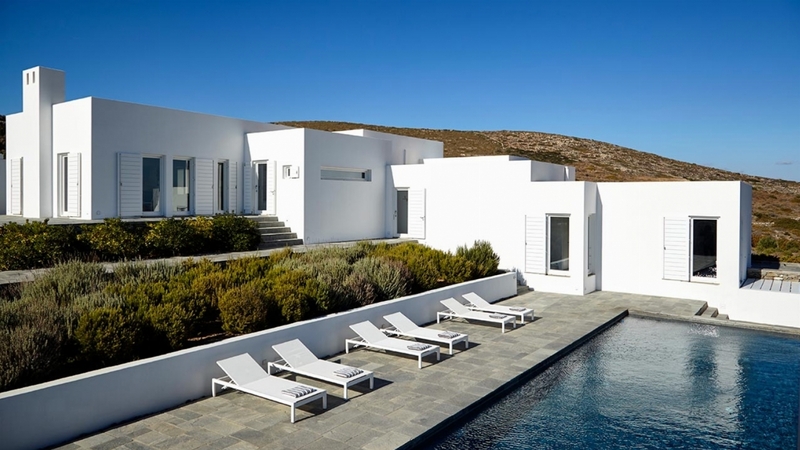 Inspired by the typical white cube architecture of Cyclades, Villa Kiki is located on a Filitzi hillside and rewards holiday guests with stunning views of the sea and the surrounding countryside. Select some of the options below to narrow your search. Stay in touch with us. There's a whole world of travel inspirations out there and we'd love to share them with you. Passionate about travel and lifestyle, inspirational finds and shared discoveries, Perfectly Chilled Villas has been created by a small team of style-conscious travellers for other like-minded travel and lifestyle lovers looking for inspirational and tempting ideas for where to stay and play during their valuable time off. Perfectly Chilled Villas is an an online portfolio offering eclectic mix of stylish villas & unusual places to stay in the Greek Islands, Portugal & Spain. From old classics to new finds, our aim is to share these inspirational finds and discoveries within one dedicated online environment. Whether you would like to enquire about our villas, or provide feedback on our website, our Travel Team is here to help.